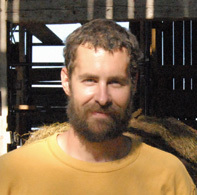 Michael moved to Vermont from Bucks County Pennsylvania in 1995. From an early age, Michael began to acquire woodworking skills from his father and grandfather. His fascination with traditional crafts and all things historical began taking shape at the Mercer Museum in Doylestown, PA, where he had attended workshops as a child. Michael continued his studies of traditional craftsmanship in college where he had the good fortune to study under a former curator of the Plimoth Plantation. Since college, Michael has continued to study the history of the craft through independent research projects. Michael currently lives with his wife in New Haven, Connecticut. Seth Kelley was born in Caribou Maine. Inspired by his great grandfather, a barn builder in Northern Maine, Seth began to participate in local barn and house raisings. In the summer of 1997 Seth enrolled in the Heartwood School for the homebuilding crafts in the Berkshire Mountains. From there, Seth worked for Connolly and Company on the coast of Maine for about a year building production timber frames. Working for Connolly was a good place to learn and pick up some vital skills, still useful today. Quickly becoming bored with producing modern frames ‘they all seemed to be the same frame with a different name.’ Seth began to knock on farmer’s doors and ask if he could document and photograph the interiors of their barns. This was where Seth really became fascinated with old joinery. He wanted know how to hew out beams from a log and lay out joinery on hewn timbers. In search for this increasingly esoteric knowledge, Seth made the move to work with traditional joiner, Dave Bowman, in Massachusetts. Bowman worked exclusively with hand tools and followed the old traditions from the felling of the tree to the raising of the frame. Seth immersed himself in the study of early barn builders. A little over ten years ago, Seth brought his family to Vermont and decided to call it home. 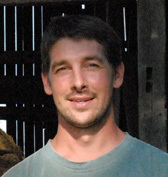 For the past 13 years, Seth has used his skill and experience to preserve our barns, covered bridges and steeples.